Step right up! Solve the maze! Win prizes! And watch your step. "Beat the Maze! Win Prizes!" reads the sign on a building called The Maze. 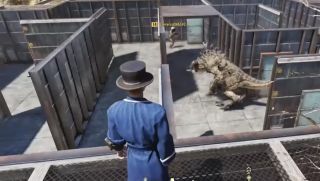 A number of Fallout 76 players have stumbled across this player-made building and met its creator and proprietor, Vault101manguy, who stands outside The Maze dressed in a bathrobe and top hat, gesturing toward the entrance. If the players step inside, he slams and locks the door behind them, then watches as they attempt to solve The Maze, a labyrinth with winding corridors, several false doors, and, oh yeah, a rampaging Deathclaw. In the video below, set to Take Me Home, Country Roads, you can see a number of players getting locked inside The Maze as Vault101manguy watches from the safety of the platforms above. It's quite a show, as players scramble to escape, finding only false door after false door as the Deathclaw chases them around. "This is entirely an experience of fear," Vault101manguy explains in his Reddit post. The Deathclaw, a creature he tamed, isn't really doing much damage to the players it attacks, due to the PvP rules that dictate a player must fight back before full damage is done. "But that is really hard to think about when you're unexpectedly faced with a deathclaw that is chasing you through a locked maze," he says. "Nobody in the video actually died," he adds. He had to create several iterations of the maze due to the Deathclaw's inability to move through confined spaces, and just finding and taming the Deathclaw took him several days of server hopping. That's dedication, but it definitely paid off in what is certainly one of the most creative and nefarious player bases I've seen.